The Death Chamber at the Louisiana State Penitentiary | Peter M. Schloss | J.D. - Mediator. At 3 p.m. on August 9, 2010, the Cycling for Change contingent arrived for our tour of the Louisiana State Penitentiary at Angola. We exchanged bicycles for a school bus. Our group was augmented by representatives of Catholic Charities of Baton Rouge, the bus driver (Mr. Washington), and Brad the prison chaplain. It is 100 degrees outside. Factor in the humidity and that number exceeds 110. The sun is relentless, coating its unshaded victims like molten glass. Our bus briefly stops under a corrugated canopy, and after a guard takes a headcount and examines our picture ID’s the gate opens and the creaks of the bus undercarriage announce that we are proceeding onto the prison grounds. Angola is unlike any other prison. It was created from 3 former antebellum plantations and encompasses 18,000 acres, roughly the size of New York’s Manhattan Island. The Mississippi River, which is nearing the end of its 2,500 mile journey, forms an imposing natural barrier on three sides of Angola. The fourth side lacks a perimeter fence as the dense mosquito infested swamp is considered an adequate deterrent to escape attempts. Brad comments that the last fellow to try his hand at “the swamp” emerged to surrender himself after 5 days, nearly eaten alive by the bugs. There are no imposing walls, and no medieval looking stone structures. Located here and there in Angola are razor wire enclosed “camps”. These are self contained penal complexes of varying size, each one holding a portion of the total inmate population. Brad tells us that there are just under 5,000 offenders, and then corrects himself stating that with the addition of the newest camp the number has grown to nearly 5,200. Camps are designated by letter… Camp “A”, Camp “B”, and so on. We learn that Camp “J” is the discipline Camp… a jail within the Prison, housing around 600 offenders who present special problems and risks. That is really significant since 98% of the entire offender population of Angola will ultimately die in Angola. 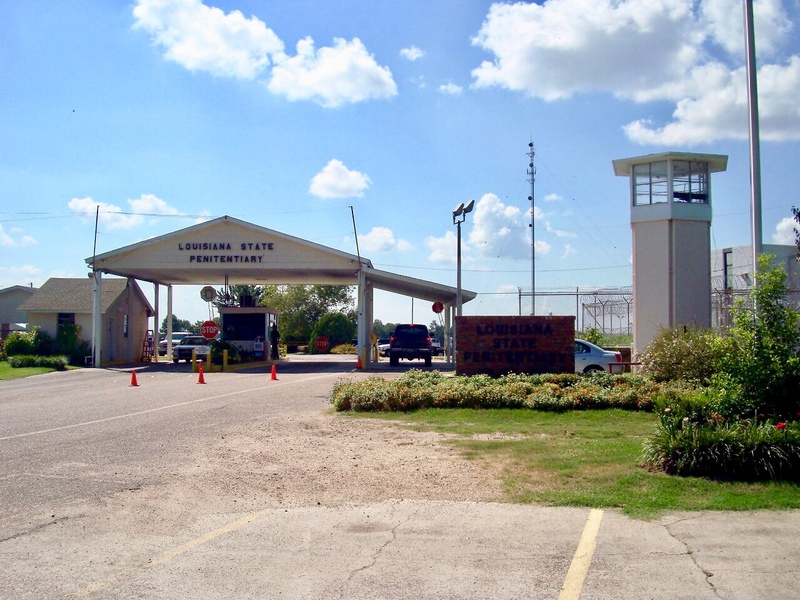 If Louisiana’s prison needs grow, it is a simple matter to build additional camps at Angola. The spacious grounds look vacant, each camp appearing as a distant community separated by flat expanses of farmland. Angola is in fact one of only three agricultural prisons in the United States. There are miles of row crops, vegetable farms, 3,500 head of cattle, and one of the largest horse husbandry stables in the Country. This prison feeds itself and provides most of the animals used by law enforcement for mounted patrols in America. Inmates are the sole source of labor on these grounds, and with the exception of the medically, mentally, or behaviorally unfit, every inmate has a job. The grounds are impeccable. There are decorative flower gardens, neatly trimmed right-of-ways, pristine white cattle fencing. This could easily be Churchill Downs if there were only more trees and a racetrack. Brad conducts our driving tour of Angola, directing Mr. Washington on where to turn and when to make stops. Brad is a curiosity in his own right. He is a man/boy of 27, married and father of two small children, his baby face and soft eyes seem ill-suited for a chaplain who ministers to the spiritual needs of one of the “hardest” congregations imaginable. Brad is a big man, a very big man, who turned down a major college football scholarship in favor of the seminary and God’s calling. As Brad talks about Angola and its residents, there is obvious love and respect for the population. God chose well. Brad speaks with pride of the reforms that have occurred at Angola over the last 30 years. Gone are the days of the “hot boxes”. Inmates are provided with a well conceived system of freedoms, privileges, and incentives. He reports that prison gang activity has been largely eliminated. Serious inmate on inmate violence has been reduced from over 500 incidents per year to less than 100 annually. Offenders have opportunities to advance their education with GED classes and college courses taught by volunteers from local colleges and even Loyola University. Inmates eagerly seek to take advantage of those programs, even if they will never have the opportunity to use the knowledge in the free world. As we proceed down one of the flat, ruler straight roads, Brad instructs Mr. Washington to stop at the small one-story concrete structure ahead on the left. This is the “Red Hat Cellblock”. Angola’s Warden, Burl Cain, is credited with many of the reforms and improvements at Angola. Perhaps he subscribes to the notion that to forget one’s history is to risk repeating it. Red Hat was closed during the reforms implemented by a prior Warden in the 1970’s. Rather than level this structure, it was placed on the National Register of Historic Places under Warden Cain’s tenure as a monument to a penal system of abuse. It is now protected from demolition. Constructed in the 1930’s, Red Hat is a long, narrow, white, single story, single hallway, standalone building surrounded by a tall barbed wire fence. It has 40 small cells, arranged 20 on each side. The corridor runs end to end. Each cell measures approximately 7 feet wide, by 9 feet deep. There was no heat or ventilation except for a small 1 foot by 2 foot barred window near the top of the 10 foot outer wall. Each cell had a single toilet to serve the needs of the occupants. Brad reported that one of the cells housed an inmate who was renowned for his repeated escape attempts. That inmate became the solitary resident of one of the Red Hat cells, his cell door being welded closed for over 7 years until near the time that he died. The grounds surrounding Red Hat are desolate and forsaken. At the rear of the Red Hat cellblock is a large rusted electric generator. Wires still run from the generator into a side room of Red Hat, the sole purpose being the delivery of a massive surge of electrical energy into the hands and feet restraints of a wooden chair within the chamber. Within that room is the original, but now rusted, three blade switch that delivered a lethal current of electricity to end the lives of the chair’s occupants. Except for the wires and stout wooden chair, the room is more like a room in a long-abandoned farmhouse… holes in the walls and ceiling, cobwebs, mud wasps flying about. Returning to the bus we leave Red Hat, but the images of Red Hat will never leave us. We arrive at the last stop of our tour. The bus pulls into a parking lot. In contrast with our experience at Red Hat, there is a well-maintained parking lot. The grass is trimmed with the precision of a golf course putting green. Flowering shrubs abound in front of and on the sides of a newer single story white building. There is no fence but the pastel colored exterior and interior doors all have curiously large locks, the kind that take keys which are the size of those made for a toddler’s play. We are greeted by uniformed prison staff, and Brad is addressed by name. We proceed into a larger room that has 5 or 6 round dining tables. The brightly painted cement block walls are decorated by two large oil paintings. They are well executed paintings of scenes from the Bible’s Old Testament; Daniel in the den of lions, and Elijah riding a chariot to Heaven. Brad makes a brief presentation before leading us down a corridor and through another door. We enter. On my right is an opened door and through that door I see that there are two small adjoining rooms which are separated from each other by a sliding wood paneled door. Each of these rooms has two rows of short but comfortable wood and leather chairs, the kind that might be found around an office conference table. I notice that one of these two rooms is slightly smaller and contains fewer chairs than the other. The chairs in both rooms are arranged for all to face the large picture windows that look into our “destination room”. Each room has a loudspeaker above the glass. …About 20 years ago, somewhere in this country or another, there was a factory. Within that factory a worker stood at their duty station. It might have been a day like any other for that person. Perhaps the worker took pride in the knowledge that the simple task being performed would result in the saving of countless lives, the avoidance of serious injury, the enhancement of safety and security for thousands of people. On that day the worker carefully selected and packaged 7 seatbelts, and addressed the shipping label: Louisiana State Penitentiary, Angola. This is enough for a book. Your narrative puts us there–no need for me to visit. I will reread this!!. A very sad and eerie place. Well told, Pete. I would want to hear the story of the many people who suffered at the hands of those inmates before I judged the need for such places. My intention was to present the experience without editorializing the issue of capital punishment. However, I do have an opinion that it should be abolished. The seemingly endless string of conviction reversals, the endless appeals, the decades long delays in implementing the punishment, all point to “flaws” that are a necessary part of Due Process. I am mindful of the victims and their families,but retribution is the least civil justification for the death penalty. I am also mindful that the person who is executed is often not the same person who was convicted. Change can occur in the penal setting, even among those serving life without possibility of release. Greg, thanks for reading and commenting.